Note: This is the last comprehensive IPM Update for the 2015 season. The trap networks are now being shut down. Limited scouting on late season crops will continue as conditions warrant. Should significant pest issues arise on these crops, information relevant to the pest and crop will be posted. 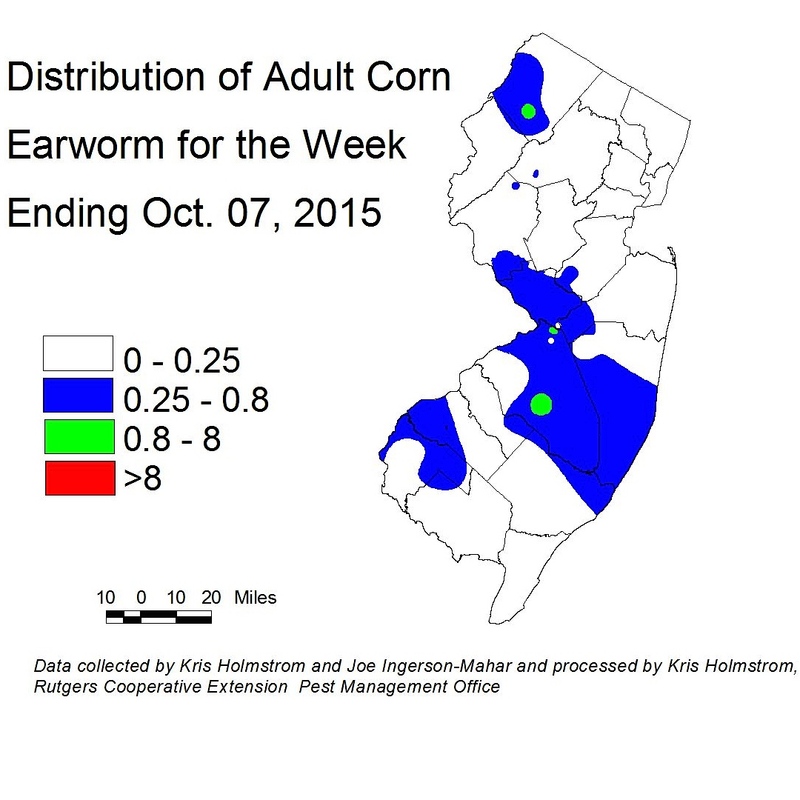 European corn borer (ECB) adults remain almost nonexistent. No map image will be produced. There should be little, if any, remaining impact from ECB this season. Corn earworm moth (CEW) activity declined significantly over the previous week, with low temperatures prevailing (see CEW Map). 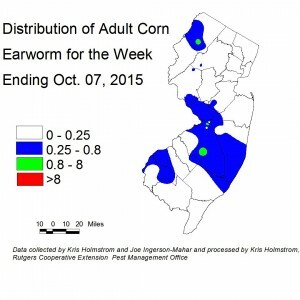 At current levels, sweet corn is at reduced threat from CEW infestation. The blue areas in the blacklight map indicate a 4-day schedule, with clear areas indicating anything from a 5 to 7 day schedule. In general, 5-day schedules are suggested throughout southern NJ at this time. Fall army worm (FAW) activity is significantly lower, but still a problem for late season corn, particularly if warmer weather returns. Crucifer downy mildew (CrDM) is now active in some plantings throughout the state. Broccoli and collard greens are especially susceptible to this disease. Signs include sharp yellow spots on the upper surface of older leaves and whitish sporulation on the lower leaf surface. It is best to treat preventively for this disease, as it can be very destructive if not detected quickly and subject to appropriate fungicides. See the 2015 Commercial Vegetable Recommendations Guide for fungicides effective against CrDM. Imported cabbageworms (ICW) are the primary caterpillar pest of cole crops at this time. Be sure to check the youngest foliage on plants, as the larvae prefer to feed on this tissue. Some diamondback moth larval (DBM) presence has also been noted in some areas. DBM are much more tolerant of pyrethroid insecticides. Therefore, if DBM are found to be present in any planting, specific insecticides must be used. Effective materials are those in the IRAC group 28 class (Coragen, Exirel, Belt) or the IRAC group 5 class (Radiant, Entrust), or combination products including these classes. See the 2015 Commercial Vegetable Recommendations Guide for insecticides effective against DBM. Consider treating if caterpillars are found on 10% or more plants that are in the 0-9 true leaf stage. From 9-leaf to the early head stage (in broccoli, cauliflower and cabbage) infestations up to 20% may be tolerated. Once heads begin to form, a 5% threshold should be observed to protect the marketable portion of the plant. For leafy greens such as collards and kale, 10% plants infested is the threshold throughout.